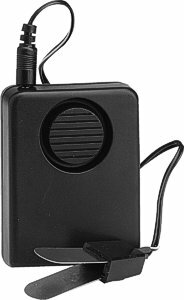 Very loud alarm brings attention to your situation immediately! This multi-purpose alarm can also protect a door letting you know it's been opened. Carry with you for personal protection or guard an interior door or window. Designed to draw attention to any crisis, our 130db PERSONAL ALARM is as loud as eight 100-decibel alarms. It is activated when the strap attached to the pin is pulled. It travels easily on your belt or in your purse. 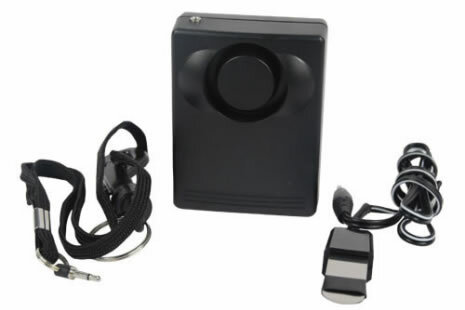 The Door accessory converts the unit into a portable door or window alarm. Great for home, hotel rooms, college dorms, etc. Requires one 9 volt battery (not included). This dual-purpose personal alarm comes with two attachments. The one shown in the first picture is the door attachment. The metal ends at the end of the cord squeeze together and slip between the door and the jam. As long as the metal ends are touching, the alarm will not go off. If the door opens, the metal ends will separate (breaking the circuit) and it will go off. The door attachment opens and closes a circuit. When inserted between the door, the two metal ends allow a signal to pass between each other. When the door opens, the metal ends separate, breaking the circuit and sending a signal to sound the alarm. Works the same on a window. The other attachment has a wrist strap and a buckle clip. Wear it on your wrist, waist, or carry in your pocket or purse. Just pull the cord and the siren will be activated. To turn off the unit with either attachment, just plug the pin back in. Requires one 9 volt battery. Belt clip included. Dimensions: 3" x 2" x 1". Weight: 1.8 oz. PULL THE CORD AND THE EXCRUCIATING ALARM GOES OFF! The 130db oscillating alarm is ear piercing! You will hear it. Have one with you while traveling to help secure your room. The cord for this attachment has a loop to hang on the doorknob and the circuit connection goes down to the floor. The cord is long enough. Tip - Use as a garage door alarm- Slip the metal clip under the door as it's closed. If your garage door opens, it will go off scaring the thief and waking you up. "4" thank you so very much .it screams .it's "LOUD " ........it's perfect alarm to attract attention !! Great little alarm. My wife and daughter have to walk to their cars at night. The alarm is loud and easy to activate. Also, great when you have to travel- no one really trusts those electronic swipe card locks.